Thyroglobulin is a protein found in thyroid cells. Antithyroglobulin antibody testing is used in the evaluation for thyroid problems. Antithyroglobulin is not normally found in the blood stream. However, 10-20% of healthy individuals have detectable antithyroglobulin levels. The reference range value for antithyroglobulin is less than 116 IU/mL. 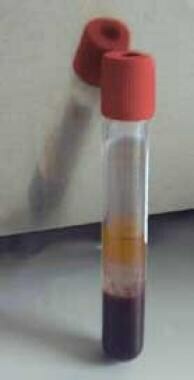 Red Top Vacutainer tube. Image courtesy of Wikimedia Commons. The 3 types of thyroid autoantigens that generate antibodies in autoimmune thyroid disease (Graves disease or Hashimoto thyroiditis) are thyroglobulin, thyroid microsomal antigen, and the thyrotropin receptor. Conditions associated with thyroglobulin antibody include Hashimoto thyroiditis, Graves disease, myxedema, adenomatous hyperplasia, thyroid carcinoma, rheumatoid arthritis (RA), chronic urticaria, systemic lupus erythematosus (SLE), autoimmune hemolytic anemia, Sjögren syndrome, and type 1 diabetes. Serum antibodies to thyroglobulin are present in 10-20% of healthy individuals. Pregnant women and family members of those with a history of autoimmune thyroiditis can also have positive thyroglobulin antibody. The autoantigen thyroglobulin is an iodine-containing glycoprotein of high molecular weight that is secreted into the colloid of follicle cells of the thyroid gland. Thyroglobulin, a prohormone, contains the iodinated tyrosine moieties that form the active hormones thyroxine (T4) and triiodothyronine (T3) after combining with the amino acid tyrosine. Thyroid hormones are essential for most metabolic process in the human body. Healthy individuals may have values of up to 30 ng/mL (45 pmol/L). Up to 10% of the general population and 20% of individuals with differentiated thyroid cancer have detectable antithyroglobulin antibodies, which represents a challenge because thyroglobulin values obtained in the presence of antithyroglobulin antibodies may not be clinically reliable. Hence, most laboratories do not release results for thyroglobulin in the presence of antithyroglobulin antibodies. Several clinical indications exist for measuring thyroglobulin antibodies. In patients with differentiated thyroid cancer (particularly papillary or follicular thyroid cancer), important information about the presence or absence of residual, recurrent, or metastatic disease can be obtained using serum thyroglobulin measurements. Thyroglobulin antibodies are present in up to 20% of patients with differentiated thyroid cancer, and this can interfere with the thyroglobulin assay, rendering it unreliable for monitoring differentiated thyroid cancer. Hashimoto thyroiditis is an autoimmune disease in which the thyroid gland is attacked by autoantibodies. Thyroglobulin antibody is 1 of 2 types of antithyroid antibodies described in Hashimoto thyroiditis. Antimicrosomal (now termed antithyroid peroxidase [anti-TPO] antibodies) antibody is the other antibody, and it is highly specific for autoimmune thyroiditis. Antithyroglobulin can lead to the destruction of the thyroid gland. However, they are not as specific for autoimmune thyroid disease. Their presence in the absence of antimicrosomal antibody is not sufficient to establish the diagnosis. Thyroid autoantibodies reportedly can be found in 10-33% of patients with chronic urticaria, but the frequency of thyroid autoantibodies in the general population is approximately 3-6%. Urticaria is also reported more frequently in patients with Hashimoto thyroiditis. Thyroglobulin antibody binds to circulating thyroglobulin and interferes with the accuracy of thyroglobulin assays (ie, immunometric assay, radioimmunoassay [RIA]), which causes the immunometric assay to yield falsely low values. Low titers of thyroglobulin antibody also cause problems, especially at low thyroglobulin levels. Conversely, RIAs tend to report falsely high thyroglobulin values in the presence of thyroglobulin antibodies. This difference occurs because immunometric assays measure only unbound (free) thyroglobulin, but RIAs measure unbound and thyroglobulin antibody–bound thyroglobulin. Thus, an RIA can still detect thyroglobulin, but it often overestimates the level when thyroglobulin antibody is present. Therefore, some authorities recommend using a thyroglobulin RIA when thyroglobulin antibody is present, because a low value is likely to be the true value, but a high value can represent an overestimate of the true thyroglobulin level. A thyroglobulin “recover” is offered by some laboratories that use immunometric assays, in order to determine if thyroglobulin antibody is causing interference. With this method, thyroglobulin is measured before and after the sample is spiked with a known quantity of thyroglobulin. If a satisfactory quantity of the spiked thyroglobulin is detected, then thyroglobulin antibody is not considered to have interfered and a thyroglobulin value is reported. Conversely, if the spiked value is unsatisfactory, thyroglobulin antibody is suggested and no thyroglobulin value is reported. Because of the differences between RIA and immunometric assay results, some experts recommend that in the presence of antithyroglobulin antibodies, RIAs should be used to measure the serum thyroglobulin (understanding the possibility of obtaining a falsely high result), with the assumption that a low value is likely to be the true value and reflect the clinical situation. This approach appears to be valid, but RIAs are not widely available and their results still need to be interpreted with caution. Spencer CA, Lopresti JS. Measuring thyroglobulin and thyroglobulin autoantibody in patients with differentiated thyroid cancer. Nat Clin Pract Endocrinol Metab. 2008 Apr. 4(4):223-33. [Medline]. Chung JK, Park YJ, Kim TY, et al. Clinical significance of elevated level of serum antithyroglobulin antibody in patients with differentiated thyroid cancer after thyroid ablation. Clin Endocrinol (Oxf). 2002 Aug. 57(2):215-21. [Medline]. Kim WG, Yoon JH, Kim WB, et al. Change of serum antithyroglobulin antibody levels is useful for prediction of clinical recurrence in thyroglobulin-negative patients with differentiated thyroid carcinoma. J Clin Endocrinol Metab. 2008 Dec. 93(12):4683-9. [Medline]. Donegan D, McIver B, Algeciras-Schimnich A. Clinical consequences of a change in anti-thyroglobulin antibody assays during the follow-up of patients with differentiated thyroid cancer. Endocr Pract. 2014 Oct. 20 (10):1032-6. [Medline]. Nordyke RA, Gilbert FI Jr, Miyamoto LA, Fleury KA. The superiority of antimicrosomal over antithyroglobulin antibodies for detecting Hashimoto's thyroiditis. Arch Intern Med. 1993 Apr 12. 153(7):862-5. [Medline]. Pocsay G, Gazdag A, Engelhardt J, Szaniszló I, Szolnoki Z, Forczek G, et al. [Hashimoto encephalopathy]. Orv Hetil. 2013 Aug 18. 154 (33):1312-6. [Medline]. Verneuil L, Leconte C, Ballet JJ, et al. Association between chronic urticaria and thyroid autoimmunity: a prospective study involving 99 patients. Dermatology. 2004. 208(2):98-103. [Medline]. Rumbyrt JS, Katz JL, Schocket AL. Resolution of chronic urticaria in patients with thyroid autoimmunity. J Allergy Clin Immunol. 1995 Dec. 96(6 Pt 1):901-5. [Medline]. Spencer C, Petrovic I, Fatemi S. Current thyroglobulin autoantibody (TgAb) assays often fail to detect interfering TgAb that can result in the reporting of falsely low/undetectable serum Tg IMA values for patients with differentiated thyroid cancer. J Clin Endocrinol Metab. 2011 May. 96(5):1283-91. [Medline]. Piechaczyk M, Baldet L, Pau B, Bastide JM. Novel immunoradiometric assay of thyroglobulin in serum with use of monoclonal antibodies selected for lack of cross-reactivity with autoantibodies. Clin Chem. 1989 Mar. 35(3):422-4. [Medline]. Spencer CA, Bergoglio LM, Kazarosyan M, Fatemi S, LoPresti JS. Clinical impact of thyroglobulin (Tg) and Tg autoantibody method differences on the management of patients with differentiated thyroid carcinomas. J Clin Endocrinol Metab. 2005 Oct. 90(10):5566-75. [Medline].